Jesus Among Secular Gods Bible Study Book includes six small-group sessions, applicable Scripture, a leader guide, "How to Use This Study," and personal-study content and activities. As belief in the secular gods of atheism, hedonism, relativism, and humanism continues to grow, it's more important than ever for believers to be able to defend and share the claims of Christ. Of course, this clash of worldviews is nothing new. Throughout Paul's writing in the New Testament are references to elemental forces that seek to separate believers from the love and truth of Jesus. 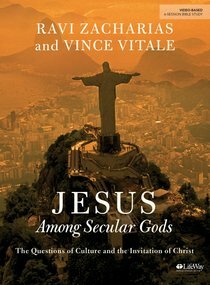 About "Jesus Among Secular Gods (Bible Study Book)"